Analyze and improve the productivity of your sales team and your business. The essential tool to ensure your productivity! 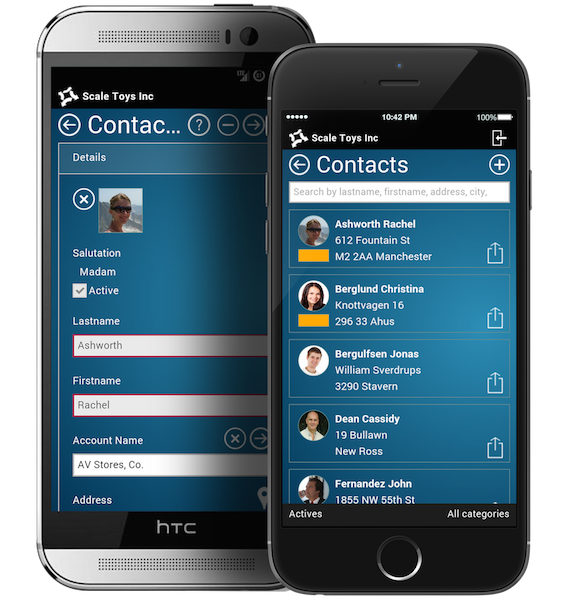 Manage customers, contacts, leads, opportunities, and all your company's activity. And so much more! Easily charge for spent time on tasks, appointments and phone calls. Your data goes with you wherever you go. Find what you need quickly, safely and accurately on all devices. Allocate permission to the right people. With the Gold account, you can manage your data access with high degree of precision. (Gold version only). Military grade encryption. Data exchanged between you and In-Mobility is guaranteed secure thanks to a 256bit encrypted key. In-Mobility is the CRM solution that effectively allows your entire team to collaborate using a single, shared platform. Improve productivity and efficiency of your sales team thanks to a complete range of reports. No need to be an expert. In-Mobility is designed to save you time, focus on doing what you do best: Selling. Take your office with you on your business trips. In-Mobility is available on Android, iOS and Mac OSX, but also on the web. All In-Mobility accounts are automatically backed up every day. We offer service continuity and quality. Take your office with you when traveling on business. In-Mobility is available on Android, iOS, Mac OS X and via the web. CRM cross platform application that no doubt deserves its 5 stars. Well-designed, accessible from anywhere and on any device. # A entry corresponds to a card, such as a customer, a contact, an invoice etc.. The In-Mobility team is available to consult with its users and continually improves the software to make the necessary updates.